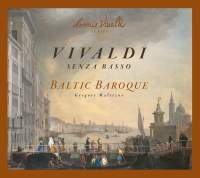 Vivaldi’s output of sonatas for two violins and bass consists of the 12 trio sonatas of his Op 1, and four other sonatas for two violins ‘anco senza il Basso’ – that is, with optional continuo bass. And indeed, with the bass-line provided being a basso seguente, doubling whichever violin part is the lower at any given point, they can be omitted to leave genuine violin duos to add to the very small number of such works from the Baroque by Leclair, Guignon and Telemann. They have been recorded before: Chiara Banchini and Véronique Méjean from Ensemble 415 played all four as duos (Harmonia Mundi, 4/92), L’Astrée did all four with continuo (Naïve, 4/04) and the Purcell Quartet half and half (on two separate Chandos discs, 9/90 and 6/91). Here two violinists from Baltic Baroque follow the last course, offering RV77 and RV71 as duos, and RV70 and RV68 with harpsichord. It seems a good way to go to me. The duo-playing of Maria Krestinskaya and Evgeny Sviridov is buoyant, sweetly sinewy, punchily detailed and perfectly matched, as indeed they have to be; Vivaldi’s duo style is to write almost exactly similar parts for them, either swapping phrases or following each other around in thirds or sixths (though one violin does make a gorgeous break for glory into a melody of its own in the finale of RV71). Yet four of these in a row might be a little too much, and it is a relief to the ear when Imbi Tarum’s harpsichord joins them, adding a touch of weight and depth to the sound. This music is slight (and at 47 minutes, so is the CD), but it is also fresh, skilfully written and with a creative spark that keeps it always alive. Thoroughly Vivaldian, in other words.